I think there is a rule that upon becoming vegan you must also instantly become obsessed with pizza. 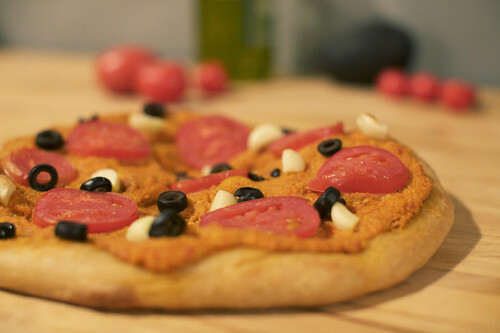 Perhaps it is the seemingly elusive nature of the delicious vegan pizza, but every vegan I know goes crazy for the stuff. I mean, pretty much everybody loves pizza, but it does seem that it’s like crack for us vegans. Nowadays there are tons of vegan pizza options, you can even go buy yourself a slab of daiya drenched pizza at Whole Foods, so there isn’t a problem finding a decent slice somewhere. There is still something tremendously satisfying about making your own pizza though. You get to top it with just the right ingredients exactly how you like it. While pizza is a common occurrence here (Shawn and I are pros), I wanted to try something a little different than the usual. I found a great recipe for beer pizza crust and was smitten. I topped it with this great sauce from Vegan Yum Yum that has a rich cashew flavor so there was no need for additional cheese. The simplicity of this pizza lets the full flavored crust shine through without being boring. The beer gives it just a little more excitement than a typical pizza crust and is crunchy on the the outside and fluffy on the inside. The recipe makes enough for two crusts so you can experiment with your toppings. Of the two I made the one pictured above was by far the best with just tomatoes, sliced olives and garlic. If you love pizza and you love beer you have no excuse for not making this crust. It’s easy and completely enhances your pizza experience. Mix and knead together all ingredients until they form into a smooth even dough. Cover and let rise for 30 minutes to 2 hours. Preheat your oven to 500° with the pizza stone inside. If you don’t have a pizza stone you can use a cookie tray but you will not need to preheat it. Divide the dough in half to make two crusts. You can freeze the dough if you’d like to save for later, just make sure to defrost in advance. Spread out the crust on a piece of parchment paper or your oiled cookie tray. Stretch it until it is 10 to 12 inches across or toss in the air if you’re coordinated enough. Brush the crust with olive oil, covering completely, and sprinkle with any pizza seasonings you might like. Place the parchment paper on your pizza stone or the cookie sheet in the oven and cook for 2-3 minutes. Remove the pizza from the oven and top with sauce and any other toppings you might want. Put back into the oven and cook for 7-10 minutes. The crust should be golden and not too brown. Remove and let cool. Slice and devour! oooh beer crust pizza sound SO GOOD right now. i am definitely gonna try this. and yeah, you guys are DEFINITELY pizza pros! oooh! I’ll have to try this, now that I have my pizza stone! I can attest to your and Shawn’s pizza prowess! Beer crust sounds very interesting and I’m a big fan of simplicity in toppings. p.s. I want to steal your mixer. This looks so good! I can’t wait to try it out. I think you’re right about the pizza addiction, I can’t get enough now that I’m vegan! I think it’s just because it’s another reason to play in the kitchen ^.^ I love your kitties BTW. What you say is true: I am a vegan who is CRAZY about pizza. I love the stuff, can’t get enough, never met a vegan slice I didn’t like! Thank you for this awesome recipe! Thank you for using and sharing our recipe and great flour. I love to visit vegan sites for inspiration. oh wow. Boy does this look tasty. I can feel my trousers growing tighter just by the thought of eating an entire one of these suckers in one sitting. Bring it on! oooh deep dish pizza sounds great. let me know how it turns out.